After about 4 years I finally finished my first Sprint build. At first this was going to be a simple, clean, wheels on build. But I got bit by Clay's detail builds and decided to go all out. This was an effort for me to do since I did not know a lot about these machines but Clay really helped me with that. 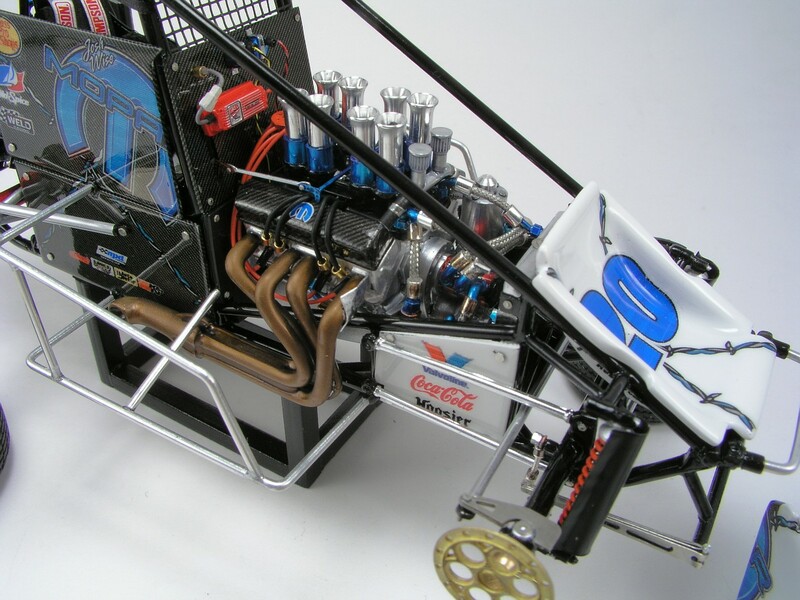 I took the old issue Kinser kit and modified the chassis to bring it up to modern specs. 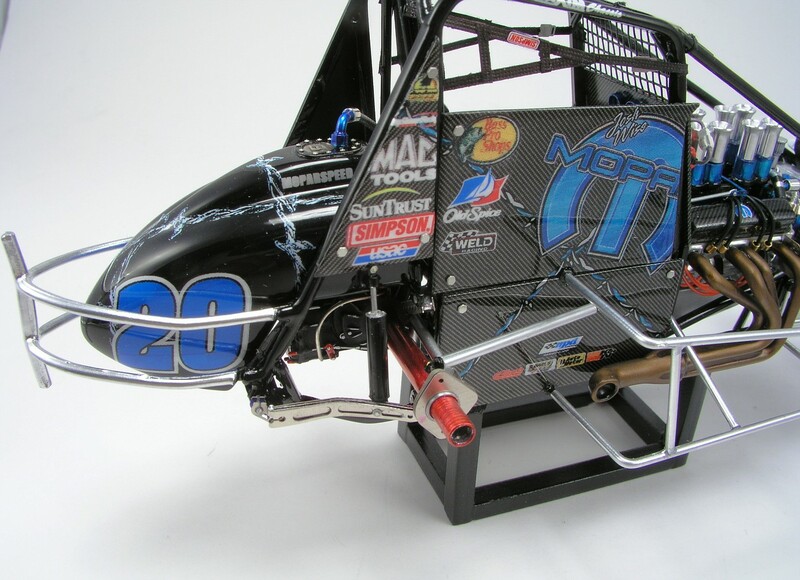 I also modified the front suspension to match the Maxim chassis that Josh ran. 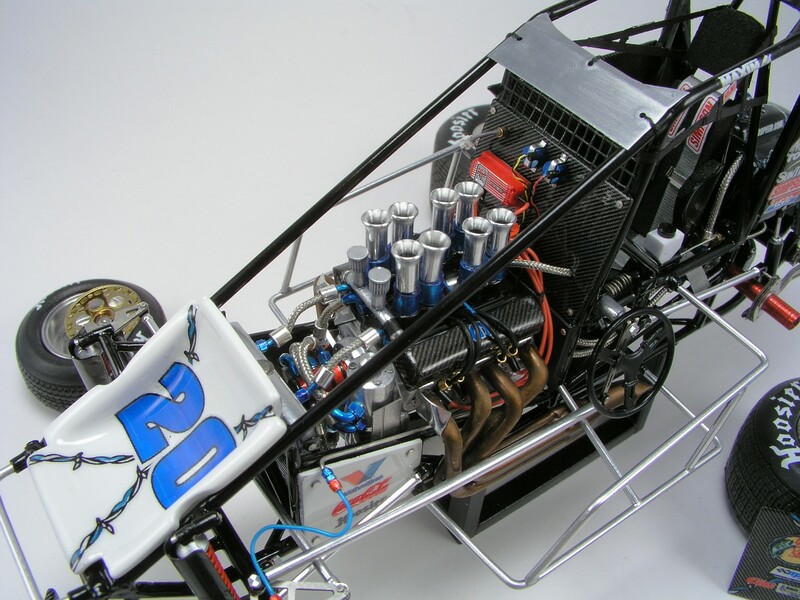 The engine is fully plumbed, brakes, and cooling system as well using pro tech and detailmaster products. 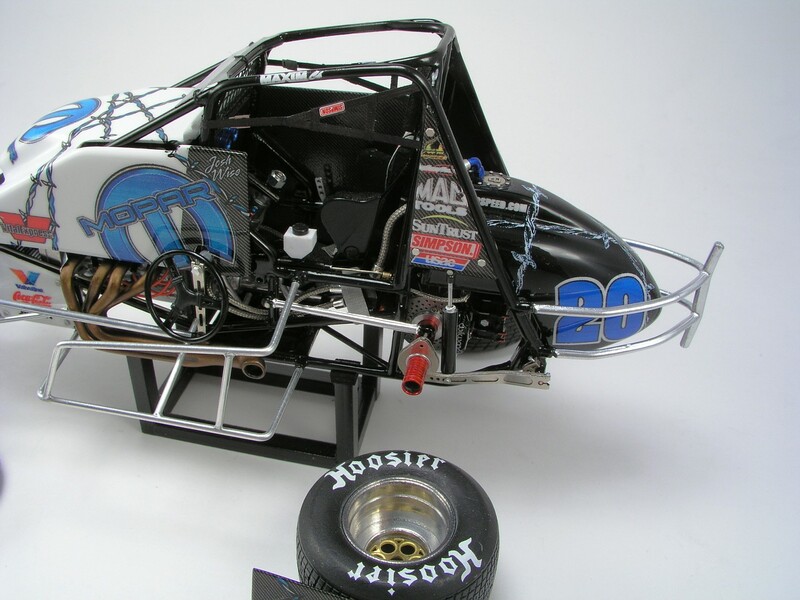 I turned the wheels and used Dirtmodeler Centers along with a Kirkey seat from him as well. 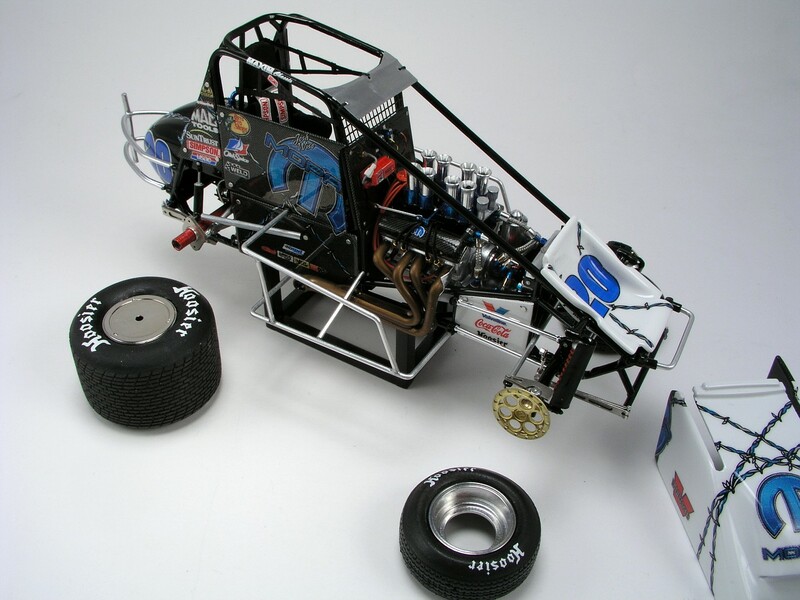 Michael Crowley's parts are perfect for these builds and compliment the build well. 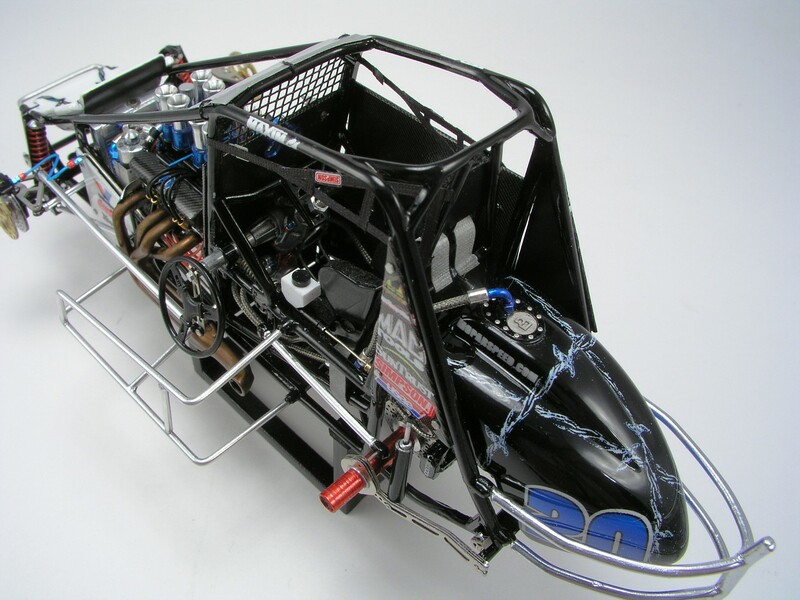 There are areas that are not dead on accurate to Josh's car as it ran in the bodywork areas and it did not have such nice velocity stacks but they add some class to the car I feel. 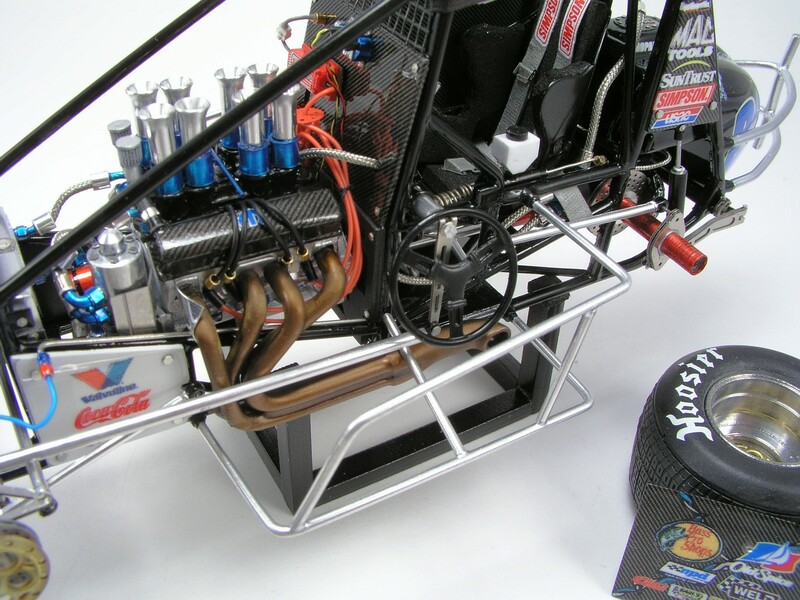 I also scratch built the Jacob's ladder, rear axle tubes and driveshaft from metal tubing. much more was added so ask any questions you want! Some of the radius rods are kit parts and some are made from real metal tubing with DM Heim joints. I wish all the radius rods were metal but like I said this build evolved more than I intended at first. Again thanks Clay for all the insight, advice, reference, and above all, the Alps decals! Nice job Dave!! Always love seeing your builds. Hope my sprint cat build comes out as nice as all guys build on here. Nice detail and a great car of choice. All I can say is WOW!!!! WOW!!! WOW!!! I can come up with some other colourful 4 letter words but WOW!!! is more PG rated... That is an awesome build. Thank you for showing us. Very impressive, Dave!! 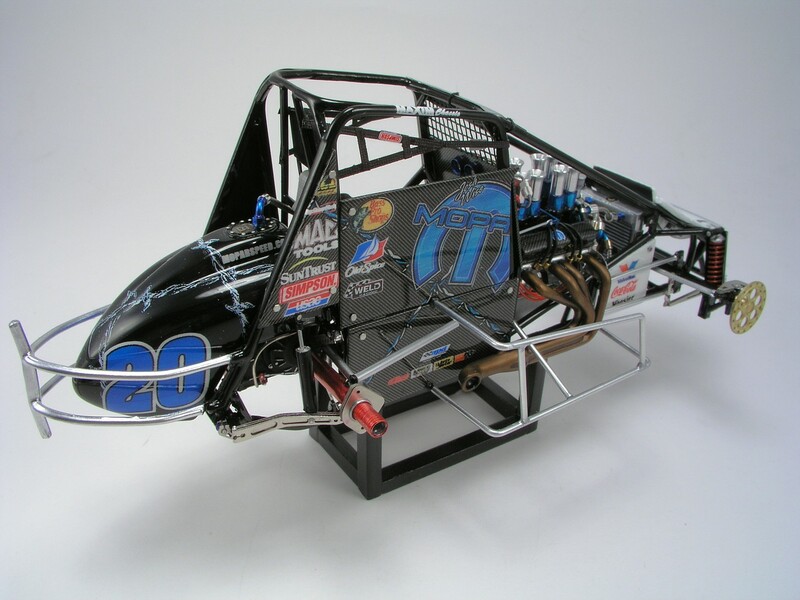 Looking forward to seeing your next dirt car!! 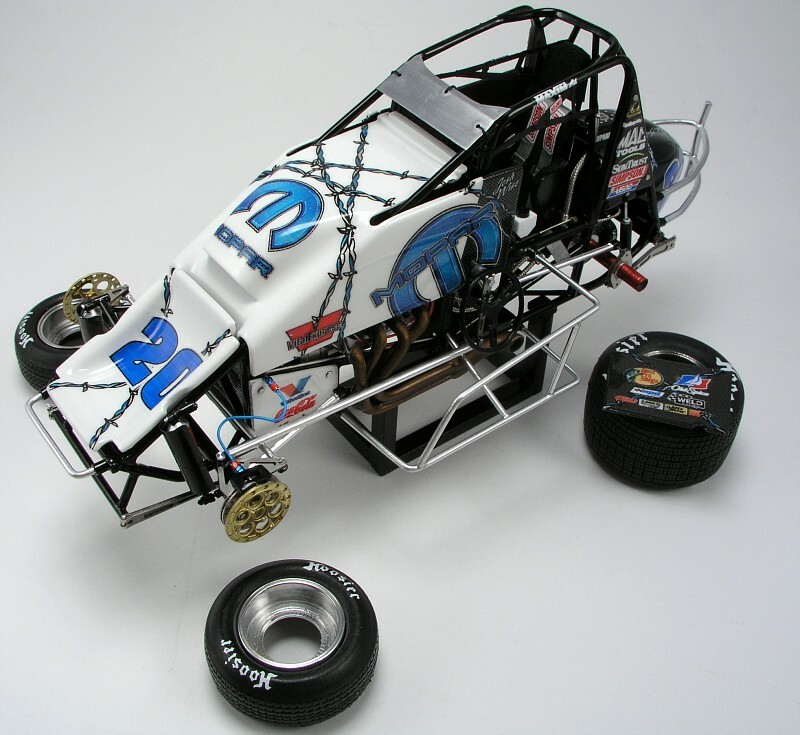 That is, without a doubt, the nicest sprint car model I have ever seen! 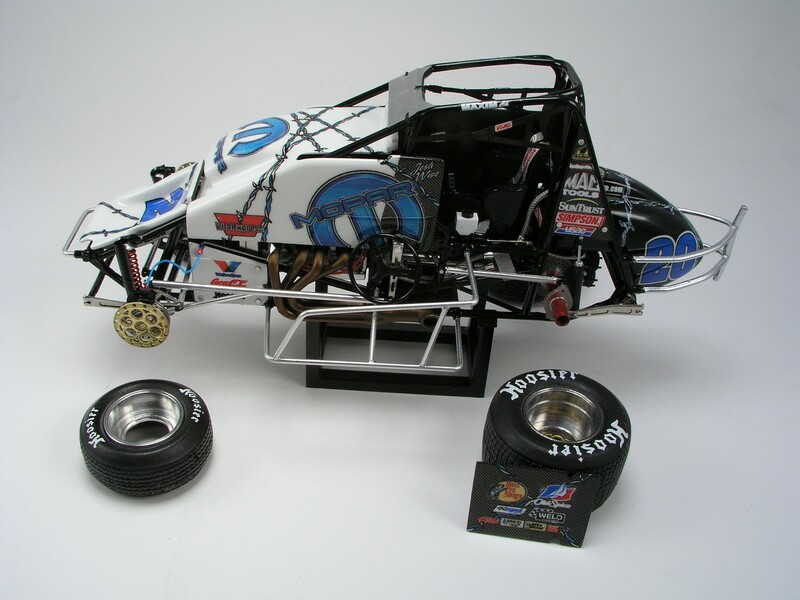 for your first sprint car build i guess it looks ok. in my opinion nothing looks better than a super detailed sprint car model.they look awesome and you did a fantastic job.i hope you build another one soon........looks like clay is finally going to build another one...everyone look out hes got a soldering gun .......thanks for sharing your build its a work of art. and Lou, I knew there was someone I forgot to thank! You too my friend have a hand in my build. You have always been an inspiration and I lurked in your albums quite a bit so thanks for the fact you have reference and great builds to look at as well! I love it. 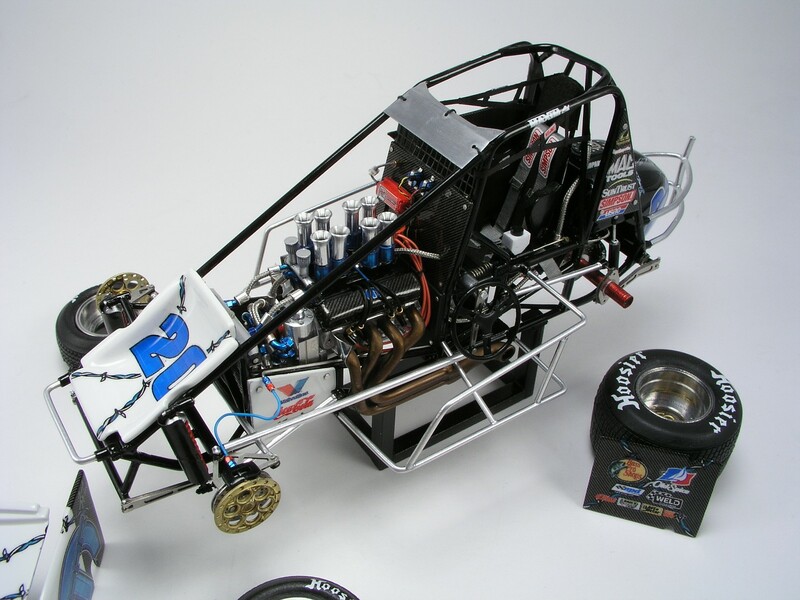 I was fortunate to get to see this car run a lot that year. 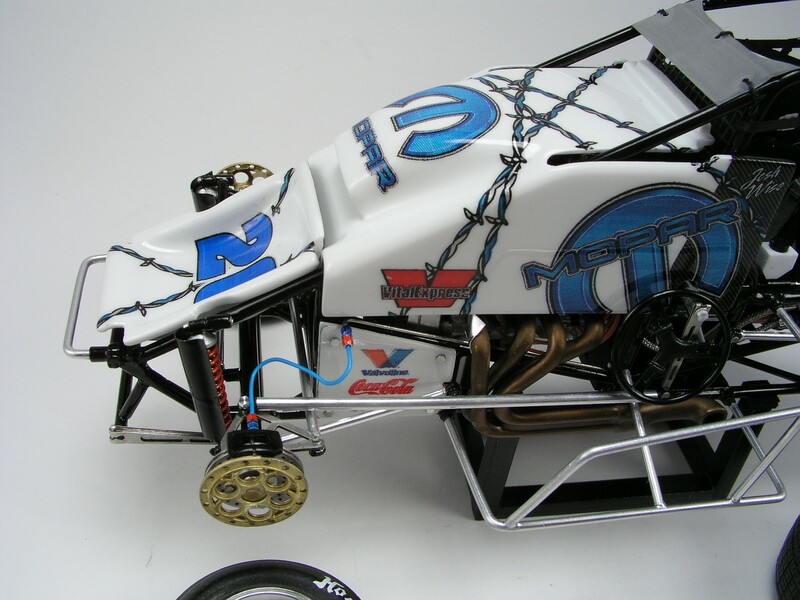 It is hard to believe that you aren't very familiar with nonwing sprints. Great job! This brings back good memories. Thanks for sharing.